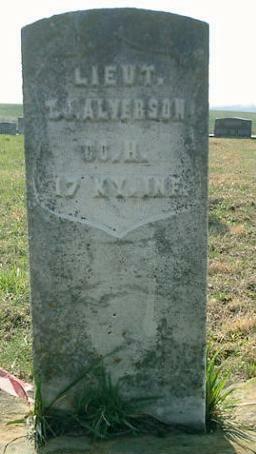 Thomas Alverson enrolled in the 17th Infantry on October 28, 1861. He was mustered in on January 4, 1862 at Calhoun for a three year enlistment in Company F. He was 1st Sergeant of Company E prior to consolidation, the 1st Segreant Company E. Promoted 2nd Lieutenant Company K, 1 July, 1863 in Manchester, Tenn. and 1st Lieutenant Company F, May 16, 1864 at Kenshaw Mountain, Georgia. He resigned on May 16, 1864. There are various dates on different page of the AG Report. There were no other remarks in the Adjutant General's report.